Historically, this has been our core business; working with small to medium sized companies, organisations and departments to understand their requirements to create cross-platform custom FileMaker database solutions that are designed specifically to their needs. With our business and project management background we focus on the requirements of the business or organisation and are usually as involved with operational procedures and reviewing existing workflow as we are actually designing the solution in FileMaker. Unlike many database providers we do not charge an annual maintenance fee to our customers, which is often based around a percentage of the original purchase price. 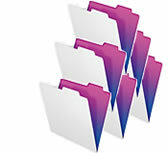 Instead we offer our FileMaker WebHelp service, which is optional after the initial proving period.  Separation of the data from the user interface allowing offline development when required, quick upgrades and a downgrade facility if required.  Versioning to allow audit trails of changes.  Fully commented scripts for future reference.  Customised security system to control access by workgroups.  Integrated Human Resources module to allow internal management of users and their access level.  Database configuration module to allow internal maintenance of database variables such as tax rates.  Personality! We encourage our customers to come up with a name and identity for their databases through a fun competition for their staff with a wee prize to the winner.